Your boy looks forward to Christmas and his birthday all year long. He dreams of that perfect gift. So, how can you make sure the gift you give him is a real winner–one he will love and use for a long time and not just discard after a week or two? Luckily for you, we have done the hard work for you. We have found the 25 best gifts and toys for 9-year-old boys. 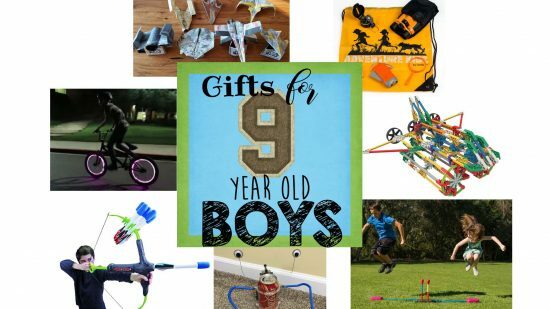 These are tried and true gifts that will become favorites for your boy. No matter his preferences or hobbies, there are gifts to fit every fancy on this list. My “almost twin” boys are 18 months apart. 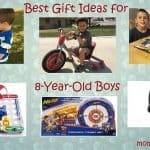 We have tried many different toys and activities for them, and I can honestly say this list has toys that will be beloved and well used by your boy and his friends. Check for quality. You want a gift that will last, and depending on the boy, that could be saying a lot. I know my 9-year-old is pretty hard on toys. Most of the gifts on this list have lasted well for him. Consider his interests. If your boy likes outdoor activities or has a hard time sitting still, an active or outdoor toy is probably a good choice. However, you might be surprised and find your typically outdoorsy boy enjoys a creative toy. Let his personality help you decide. For a social butterfly, a gift that can be used by multiple people is a nice option. What’s your budget? Of course money factors in, so decide what you can spend, but don’t be willing to compromise quality. 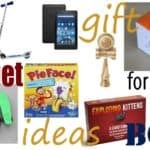 This list contains a wide variety of gifts at different price points. How long will your boy be interested? If you think a gift will be fun for a while but will then become boring, you should probably keep looking. Choose a gift that will keep his mind or body engaged time after time of using it. Now that your boy is 9, he’s ready for some more grown-up toys, and the Razor A5 Lux Scooter is a good choice. 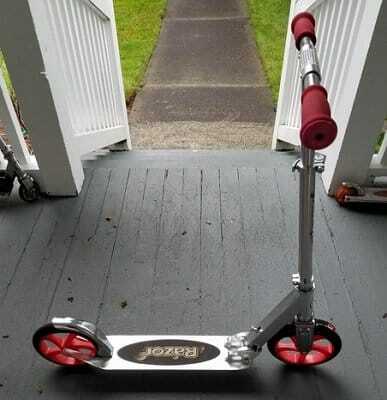 It is similar to the original Razor kick scooter, but with some fun upgrades. The wheels are extra large, and the handlebars are adjustable. Even with the larger wheels, this scooter folds up and is easy to carry. Braking is easy with the rear fender brake, and the foam grips keep the rider from getting blisters. A retractable kickstand makes parking simple. If all of this is making you want a turn to ride, rest assured that the weight limit for this scooter is 220 pounds. Go ahead and take it for a spin! I am very impressed with the quality of Razor products. The aluminum is heavy duty, and you can be sure this scooter will last the test of time. That is something I appreciate because it can be used for subsequent kids! Any 9-year-old boy would love receiving the Razor A5 Lux Scooter as a gift. I refused until I saw this foam set. Can you hear my sigh of relief? They can have their fun shooting, and I don’t have to worry about them dying. Plus, the Marky Sparky Faux Bow Pro is so much easier for them to shoot! You simply load the arrow, pull back on the string, and let the arrow fly. Arrows can go as far as 200 feet with this bow. Also, the quiver is attached to the bow and holds 3 arrows. 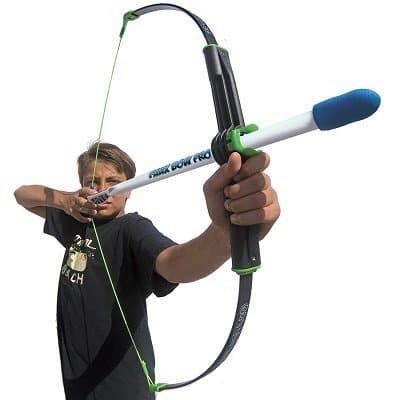 My boys love this because with 3 arrows, they don’t have to retrieve the arrows so often. Rockets seem to be all the rage, at least for my boys and their friends. 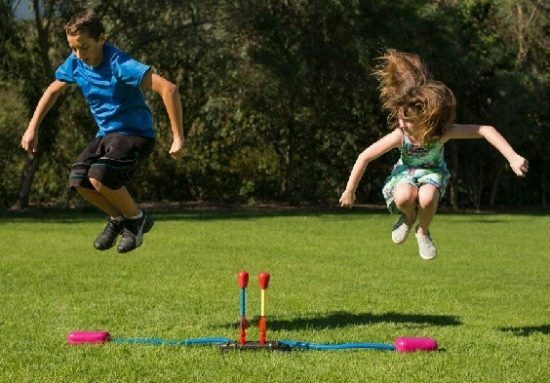 The Stomp Rocket Dueling Rockets will keep your kiddo and friends entertained. It comes with 2 launch pads and 4 rockets. Place the rockets, then stomp on the launch pad and see whose rocket goes higher. With a soaring capability of up to 200 feet, the rockets will keep kids coming back for more competition! I have to admit I was a little skeptical about the durability of this product, but I am happy to say I am pleasantly surprised. My boys are anything but gentle, and yet the Stomp Rocket is still going strong. It can even take the force of adults using it (I may or may not have tried it a time or two). Before I had kids I vowed my boys would never play with guns, but somehow Nerf guns have made their way into our home. My boys think they cannot live without Nerf. Nerf guns are loved by boys of all ages, and this is an excellent choice for a 9-year-old. The Mega Cyclone Shooter Blaster shoots 6 bullets up to 100 feet. It has a rapid-fire, allowing the shooter to shoot all 6 bullets in rapid succession, which boys really like. 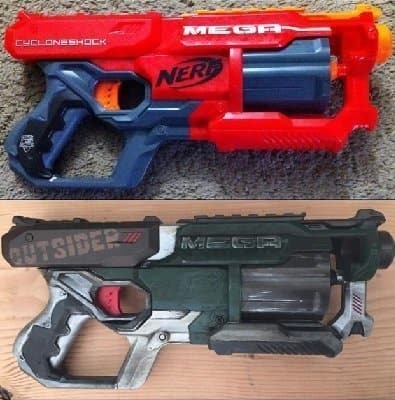 There are two different styles of Mega Cyclone Shock Blasters available, as seen in the photo. The Mega Blaster is easy to load, and bullets are interchangeable with any Mega Nerf gun. Mega Nerf bullets are fun because they whistle as they fly. They are also bigger in diameter so they can fly farther distances. My boys love chasing each other with Nerf guns, and I love that these guns don’t require batteries! Safety is first when it comes to parenting. We know kids need to wear a helmet when riding bikes, but what about when it’s dark? How do you ensure your child will be seen on his bike? 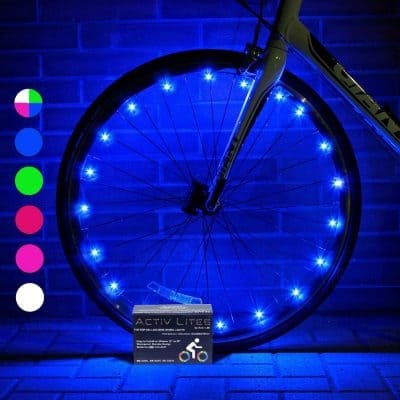 Activ Life LED Bike Wheel Lights are sure to alert drivers and other riders that your child is riding. A normal bike light can be seen from the front or back but not from the sides. These lights can be seen from any angle, and 7 different colors make them fun to use. Installation is quick and easy and requires no tools. Included are the lights, zip ties, and 3 AAA batteries. Follow the included instructions and you will be riding off into the sunset. The lights have the option of constant beam or flashing. Each unit comes with lights for one wheel, so be sure to purchase two if you want to light up both tires. Mix and match colors to make your boy’s bike the envy of the whole neighborhood! Fishing is a great activity for young boys, and it gives a chance for fun bonding with your child. 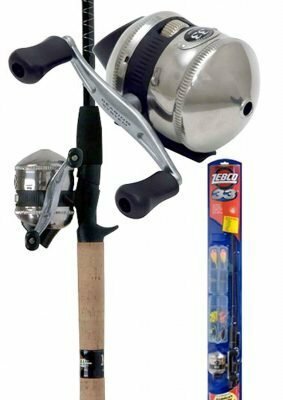 The Zebco 33 Spincast Combo is an excellent choice for a novice angler. It is a quality pole at a good price. The reel has a changeable retrieve, meaning it can be used by either right-handed or left-handed users. It comes pre-spooled with 100 yards of 10-lb. line. Like many similar poles, this one separates into two pieces for easy transport and storage. Measuring at 5’6″, this pole is long enough to last your boy for years. A small tackle box is included. Your boy will enjoy having his own tackle box, even though it is very small and not especially high quality. We have had a great time using this pole in our fishing adventures. The Zebco 33 is even long enough for me to use and be successful in catching fish! US Fish and Wildlife can help you get a fishing license in your area. I don’t know about your 9-year-old boy, but mine is starting to think he is too old for pretend play. Sniff, sniff. That is why I love the Adventure Kidz Outdoor Exploration Kit. It gets him outside looking for bugs, rocks, birds, and anything else. It also encourages him to use his imagination to pretend he is on a safari or looking for dinosaur bones. 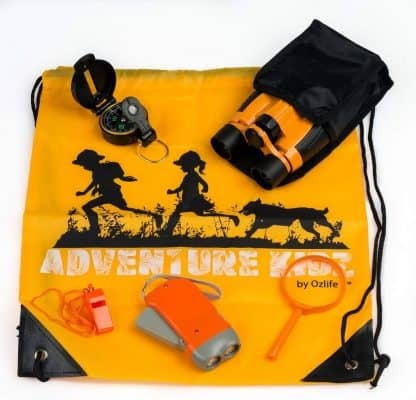 This kit comes with binoculars, a compass, a whistle, a magnifying glass, a hand-cranked LED flashlight (needs no batteries), and a backpack to carry it all. Your little explorer will love having all the gear to search for creepy crawlies or to spy on his sister! We have had fun using this kit to fulfill Cub Scout requirements as well as just to explore and have fun. My great-grandmother was an amazing sketch artist. I didn’t inherit her talent. And neither did my boys. Thank goodness for Crayola Light-up Tracing Pad. It allows kids to create excellent pictures without having to possess great drawing skills. 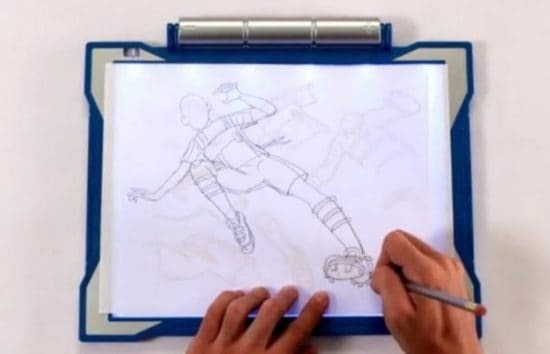 Simply place one of the 10 template sheets on the light-up pad, cover it with a blank sheet, and trace the image. Then color the picture with the included colored pencils. This kit is specifically for boys. The templates are sports and rock concert scenes. Crayola also has additional free downloadable templates. Because of the light on this pad, boys can enjoy using it day or night. It is a great activity for car or plane trips or just when your child needs a little wind-down time. If your 9-year-old would like to learn art from someone qualified the Artist Network can help you find an art instructor for your child. I have a confession. I love that my boys are involved in Cub Scouts, but I hate the pinewood derby. Usually, the dads build the cars for the boys, and the competitive atmosphere is crazy! Dads end up yelling at each other and boys leave in tears. At least it has been that way at the half-dozen pinewood derbies I have attended. My boys love the pinewood derby, though. They rarely finish in the top three, but they love building their cars and watching them race. Now we can have the best of both worlds with the Made By Me Build & Paint Your Own Wooden Cars. The cars come already cut (hooray–no more saws or sanding rough wood). In addition, the kit comes with everything needed to assemble and decorate 3 complete cars: paint, paintbrushes, stickers, and glue. 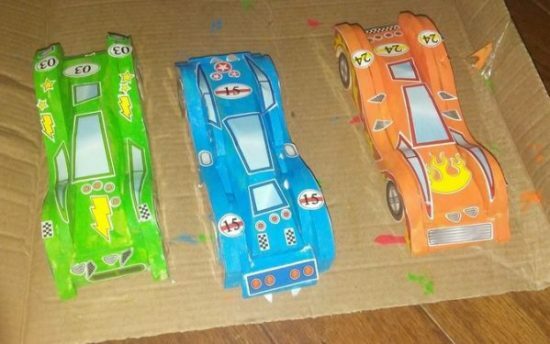 Making these cars is a fun project for any time, and the completed cars are fun to race indoors or outside. Boys also enjoy making their own track to race their cars on. 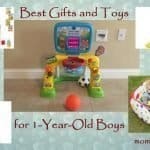 This is a great gift for boys that will keep them entertained and off a screen! 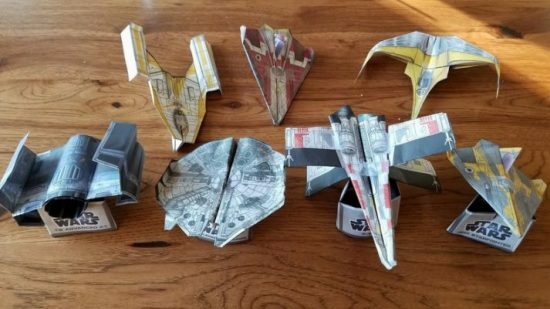 What’s better than Star Wars or paper airplanes? A combination of the two. This kit includes 40 sheets of designer Star Wars paper to make 30 starfighters. It also comes with 6 display stands and tape to keep the airplanes together. The instruction book has 60 pages full of step-by-step, easy to follow instructions so your boy shouldn’t need much help to fold the planes. These starfighters have been tested to be aerodynamic and easy to fly. They also look just like the fighters used in the Star Wars movies, which will have your 9-year-old excited. There are five copies of each design, so your little Jedi can have a whole fleet at his command! They are fun to display or to fly in competition with friends! The Klutz Star Wars Folded Flyers received the Parents’ Choice Award and the Tillywig Toy award. Who says bracelets are just for girls? Boys can look cool with bracelets, too. 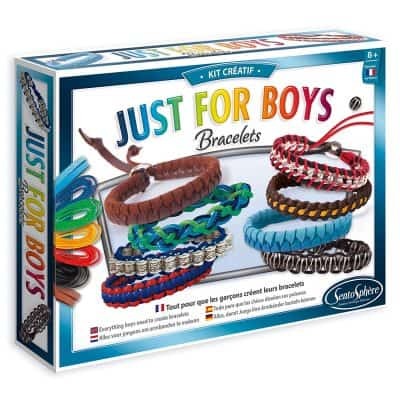 SentoSphere has created this bracelet-making kit specifically for boys (makes more rugged and bulky, less colorful bracelets). With all the supplies needed to make 8 bracelets, this kit will keep your boy busy and happy. Included in the kit are 40 silver beads, 2 imitation leather cords, 8 cotton-waxed cords, and 3 silver fasteners. My boys really liked learning how to make the braided bracelet. This kit comes with a large variety of colors and patterns, so the creative possibilities are endless! Your boy can follow the given patterns or create his own. These bracelets can be shortened, if needed, to fit smaller wrists. This is an activity your 9-year-old can do himself, though the written instructions are somewhat hard to follow. However, the pictures are helpful. Perler Beads are, hands down, the favorite activity of all ages in my household. And anytime any of my kids’ friends come over, they want to create with Perler beads. That is one reason I have two of these 22,000 count Perler bead jars at my house. 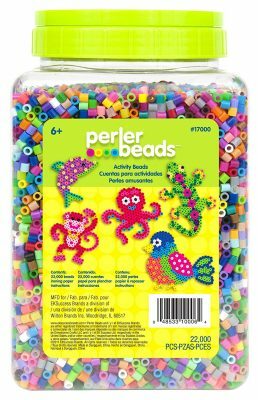 You should know that there are cheaper knock-off beads available, but we have tried them and they don’t come close to Perler beads. Other beads melt completely and leave a big mess on the pegboard and on the ironing board. In order to use Perler Beads, you need a pegboard. My kids love having a pattern book, though it is not necessary. There are free patterns available online, and we have even used Minecraft pictures as patterns. Or, kids can just create something they think up themselves. 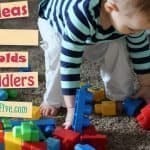 Building is a valuable STEM activity that will exercise your child’s brain. The K’NEX 100 Model Building Set provides your son with 100 different construction options (plus an endless amount he can come up with on his own). 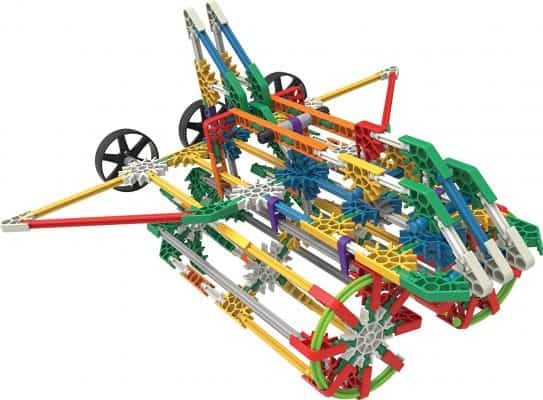 K’NEX uses rods and connectors to create impressive structures. This set includes instructions for building a blimp, an ambulance, the Eiffel Tower, and many, many more creations. One thing kids love most about K’NEX is that it comes with moving parts. Most other building toys don’t have that option. With this set, your boy can create a car with moving wheels, a transforming animal, or even amusement park rides that move! Kids can combine science and art with the Grow ‘n Glow Terrarium. 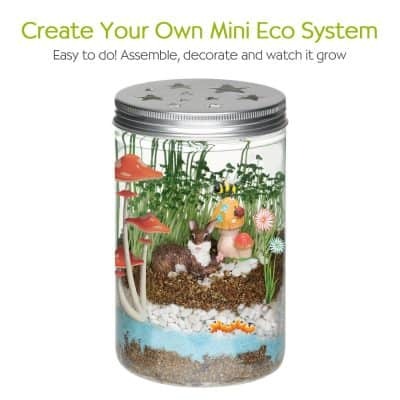 This kit comes with everything needed to create a fun growing terrarium. A glass mason jar houses the potting soil needed to grow the chia and wheatgrass seeds. Add river rocks and garden figurines to make the terrarium even more realistic. Finally, glow in the dark stickers light it up at night. All the light required to grow the plants in this terrarium is whatever light bulbs you have in your house. You can also place the terrarium on a windowsill for more natural light. Your boy will enjoy making his own terrarium just the way he wants it. Follow the instructions by watering the seeds with the included plant mister, and see the plants begin to grow within 3-4 days! Eventually, the plants will grow out of the top of the container. At that point you can either let it keep growing in the same container or transplant to a larger container. This National Geographic kit provides a science lesson while kids are having fun. 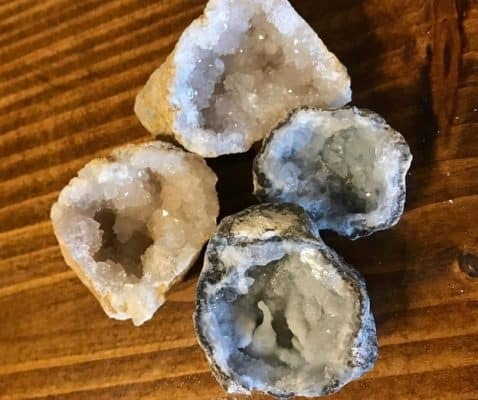 Your 9-year-old will love smashing open these 10 geodes to reveal the crystals inside. These natural geodes form through volcanic eruption, and each geode is unique. Every time we go into a gift shop, my kids love looking at the geodes. I am always amazed at how expensive they are. This kit is inexpensive and fun, and it gives you beautiful geodes for a fraction of the price. The crystals inside the hollow geodes could be fluorite, quartz, calcite, or amethyst. The kit comes with 10 geodes, a pair of safety glasses, a display stand, and a 16-page color manual showing different crystals and explaining all about how geodes are formed. Kids will enjoy this kit, but we do recommend parent supervision while opening the geodes (AKA hitting them with a hammer). 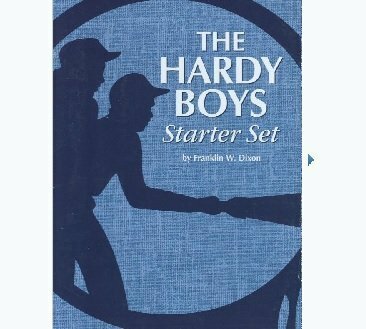 The “Hardy Boys” book series is a classic, and even though it was originally written nearly 100 years ago, it is still loved by boys today. It is full of excitement, adventure, and mystery and will keep your boy coming back for more. Boys love trying to figure out the answer to the mysteries in these books. Whether it’s discovering the identity of a burglar, stopping a sabotage, finding kidnapped kids, or looking for hidden treasure, the Hardy boys keep the reader turning pages. Their detective skills make readers want to hone their own skills. If you have a boy who doesn’t like to read, this series is a good one to try. The story lines are intriguing, and the characters are very relatable. Try reading with your boy and you will see what I mean. This set contains the first 5 books in the series. Let’s face it: kids love all things electronic. We might as well put that to use and let them learn while using electronic devices. 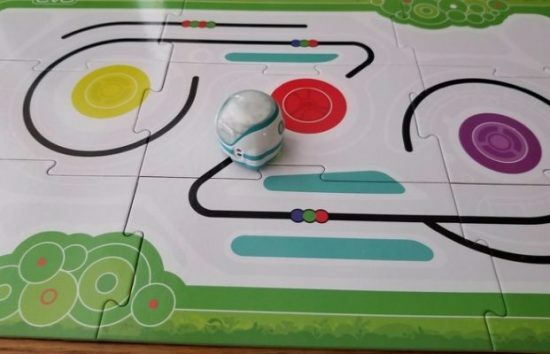 The Ozobot Evo App-Connected Coding Robot may just become your child’s new best friend. Evo is an award-winning robot that is great for kids at any coding level (beginner to expert). There is no assembly required, and Evo will continue to challenge your child as he progresses. Games and challenges make the coding fun, and the more games you play, the more your coding level advances. The Ozobot Evo App works with most Android and iOS devices. This robot has a sound system, Bluetooth capability, optical and proximity sensors, and a USB charger. While the Evo is a bit expensive (around $75), it will be well loved and used by your boy. Just an FYI: This fantastic robot is quite small (as shown on the photo above). Some of the photos you see of it online make it appear to be much bigger. This is a fun toy for boys to construct a simple robot. The kit comes with everything you need except an empty soda can and one AA battery. 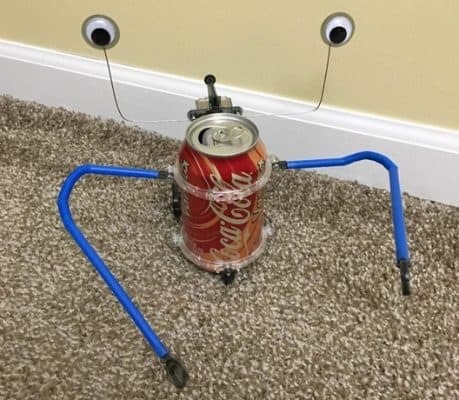 The instructions are complete and easy to follow, but depending on his capabilities, your boy might need a little help from you to make the robot. My husband and son had a great time constructing this robot together. The included pieces allow you to make either a robot or a monster, and you can choose if you want it to stand up or lie down. You don’t even need any tools–the kit comes with a small screwdriver to attach everything. The wheels allow the robot to move, which was my son’s favorite part. This is a fairly inexpensive toy and not one that does well with rough play. Science experiments are such a fun activity for boys. They make the ordinary and mundane exciting and explosive. Who wants to track down all the unusual ingredients needed for experiments, though? This science kit has instructions and those unusual ingredients for 11 different science experiments. You just need a few items that you probably already have around your house: a plate, measuring spoons, baking flour, grape juice, tape. Combine those items with the items in the kit and you will have some awesome learning and exploring going on. 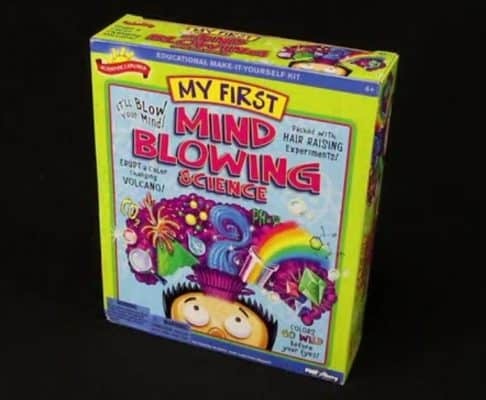 I love that this kit makes kids think about the “why” of science. Your 9-year-old will enjoy watching liquids change colors, making a volcano, and testing for acidic or basic reactions. While there is nothing dangerous in this kit or in these experiments, we recommend adult supervision for children using this kit. Boys love all things gross, so this is a favorite among boys. 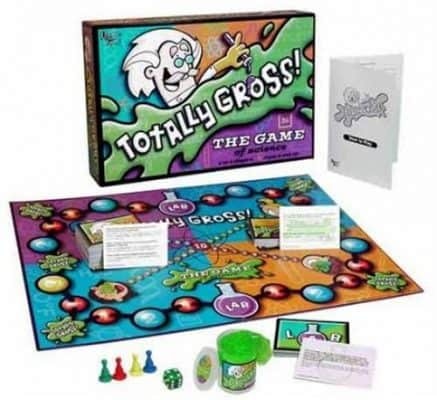 Totally Gross: The Game of Science combines humor and science to entertain and teach at the same time. In this game, players answer silly science questions and participate in “gross” challenges (like looking up someone’s nose and describing what you see, showing your belly button and then learning more about belly buttons). The only issue with this game (apart from the childish humor aspect) is that for game pieces, you use green slime included with the game. The slime tends to dry out quickly. You might need to use other objects as game pieces or use play-doh after the slime is no longer usable. 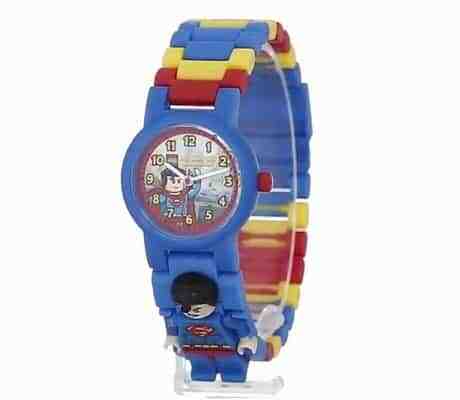 Your little superhero will love this watch! It is one of my son’s favorite birthday gifts and has lasted through a lot of bumps, hits, and smashes. Not only is this a watch, it doubles as a toy. Included with the watch is a Superman minifigure that attaches to the watch. The individual, interchangeable LEGO links snap together to form the watchband. That means you can make the band as small as you need to for your boy’s wrist. Then, as he grows, your boy can add more links to make the band larger. The analog display helps kids learn to tell time, and the scratch resistant lens makes it easy to see the watch face. This watch is high-quality, as you would expect from LEGO. It comes with a 2-year warranty. Is it a blanket? Is it a sleeping bag? It’s a Blankie Tails Shark Blanket. This fun take on a blanket is fun for any 9-year-old boy. The blanket is a shark with its mouth open, and the boy fits right inside. 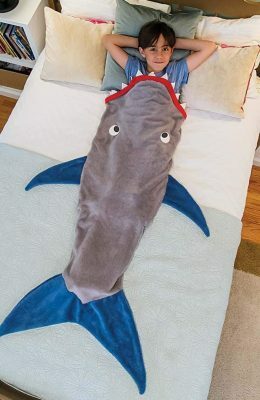 The Blankie Tails Shark Blanket is made of soft, quality double-sided Minky fabric, and is embellished with fabric teeth, eyes, fins, and tail. Great news–it’s even machine washable! This specific blanket is for kids 5-12 years old who are no taller than 4 feet 11 inches. That means unless you have a very tall 9-year-old, your boy should fit in this for at least a couple years. Boys love to cuddle up in this blanket for movie night, slumber parties, read-a-thons, or even on their beds for everyday use. I don’t know about your 9-year-old, but mine loves Harry Potter and LEGOs, so the combination of the two is his dream come true! While this is one of the most expensive gifts on this list, it is a show-stopper. It will provide hours of entertainment as your boy builds the castle containing 878 pieces. 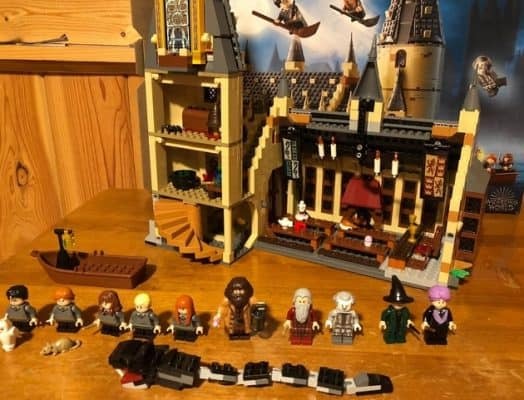 After the castle is built, he will enjoy playing with the 10 mini figures, including Harry Potter, Ron Weasley, Hermione Granger, Albus Dumbledore, and other favorites. It even comes with a mini figure of a dual-faced Professor Quirrell/Lord Voldemort. Four animal figures are also included with this set. The finished Hogwarts Great Hall building looks fantastic. Inside it has the Hogwarts house banners, a treasure room, a potions room, and even a movable staircase in the tower. Star Wars was so big when I was a kid, but I knew nothing about it. Now that I have boys (and a husband) who are obsessed with Star Wars, I am surrounded by it. All three of my boys decided they had to have a “real” lightsaber. Each of them chose a different lightsaber. 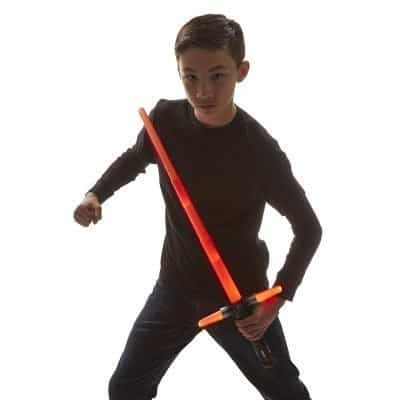 One chose this Kylo Ren Electronic Lightsaber, and it is now the favorite of all of my boys. It has made for some epic lightsaber battles! This lightsaber looks so much like the actual Kylo Ren lightsaber in “The Force Awakens”. It also lights up and makes the unmistakable lightsaber sounds from the movie. Also included is the light dagger, which can be collapsed into the bottom of the lightsaber handle. The Minecraft Stop Motion Movie Creator allows your boy to create a Minecraft movie of his own. Download the free app on a smartphone or tablet. Then start shooting the movie. This kit comes with a movie stage and 4 different background cards to change the setting of the movie. Also included are 4 mini figures: Exclusive Spider Jockey (with enchanted bow), Exclusive Alex (with diamond pickaxe), Zombie, and Zombie in Flames. Props are also included as well as a tablet/phone holder. Making a movie is easy by simply follow the steps on the app. 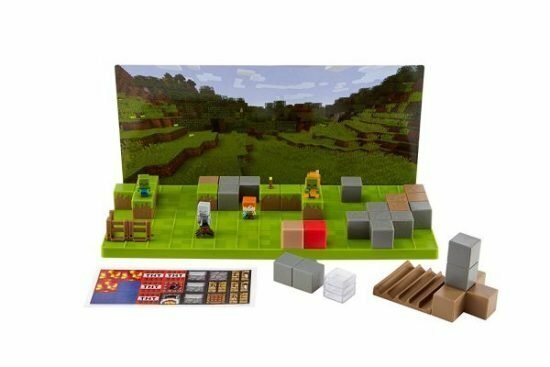 This gift will provide hours of fun for any Minecraft or movie-making kid!